Fishball noodles and pork porridge are comfort foods for many. For us, ice cream is a go-to and an essential, especially with such merciless weather all-year-round. Some may say that what sets good ice cream apart from subpar ones is the use of quality milk and cream, but we beg to differ. 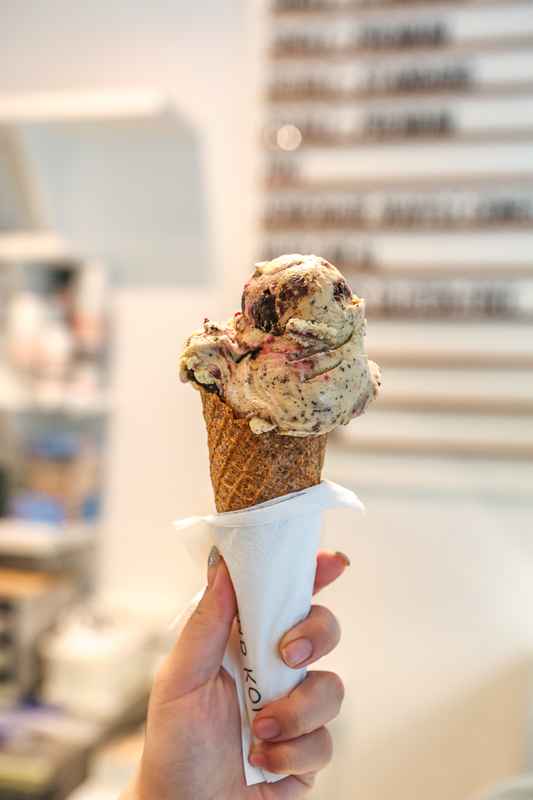 Kind Kones is a new ice cream parlour in Orchard that serves vegan ice cream—yes, that means that no milk nor cream is being incorporated in its making and less guilt while consuming your ice cream! The best part? It doesn’t compromise the taste nor the quality of their desserts. Originating from Malaysia, the brand’s philosophy is to use 100% all-natural, unprocessed ingredients without the use of any refined sugar, preservatives nor additives on top of keeping dairy products and eggs out of the production. Kind Kones specialises in churning out creative flavours of vegan ice cream. Patrons can choose to pair their desserts with cones (+S$0.6/1), brownies (S$11.50), cookies (+S$1 each) or make it a banana split (S$10.50). The cafe also serves a selective range of vegan cakes and light bites on top of the aforementioned treats—a healthier alternative to calorie-loaded cakes you’d get elsewhere. Digging in to the Black Forest ice cream (S$6.90) with Wholemeal Cone (S$0.60), we were pleasantly surprised to find that the ice cream came with a superbly creamy texture—one we reckon was difficult to achieve without the use of dairy products. Made using coconut milk, cashew milk, almond milk, vanilla, brownie chunks and cherry compote, the Black Forest ice cream got us hooked from our first mouthful. The sweet ice cream base went excellently with the tangy notes from the bright purple cherry compote and the brownie chunks gave the ice cream an added chewy texture. Next up, we got ourselves an Ice Cream Sandwich (S$8). 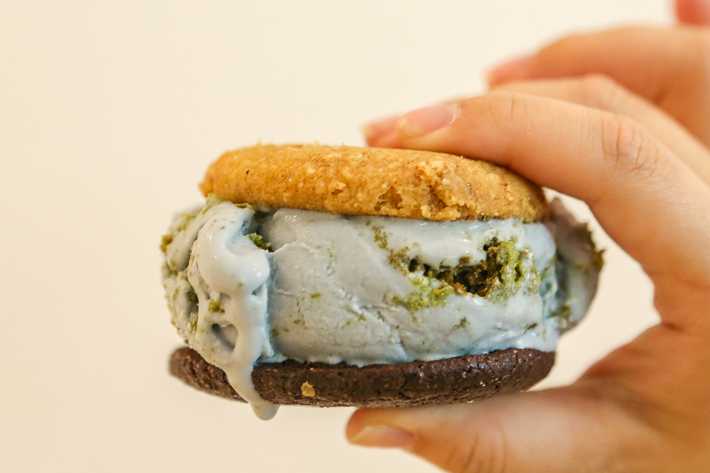 We paired an oatmeal almond crisp cookie and a dark chocolate chip cookie with Blue Planet, an ice cream flavour derived from coconut milk, cashew milk, butterfly peak flower, vanilla and matcha cake. The ice cream came with a gorgeous blue hue and had a strong earthy flavour. Similar to the Black Forest ice cream, the Blue Planet came with chunks of matcha cake to give it an elevated texture. We thought that it was a smart move to have chunks of matcha cake inside the ice cream as it made the large scoop of ice cream less cloying. Kind Kones is certainly a good spot to head to if you’re looking for a place to unwind and treat yourself to an ice-cold, sweet dessert without having to worry excessively about the consumption of unhealthy refined sugar and preservatives.